Wilson had to choose between cricket and rugby after playing four one-day internationals for New Zealand in the early 90s, choosing rugby and forging a brilliant career for New Zealand, playing 71 matches including 60 Tests. He is also one of the country's leading Test try scorers with 44. 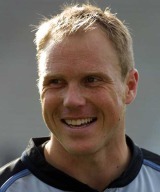 Wilson's cricket career failed to take off immediately following his retirement from rugby, but during the 2004-05 season an upturn in form saw him gain a surprise call-up to New Zealand's squad for one-day internationals against a World XI. Following his call-up he went on to win two more ODI caps for the Black Caps against Australia in 2005, but never won that elusive Test cap.